Somewhere out there is Sgeir Reef blue … it is so dark towards the horizon that it is almost purple … yet icy blue close up like the colour of the edge of glass. A wee cup of tea that’s what I need, then I will make a start … several cups of tea later … its pointless I think I will just put the sketch book away. It’s impossible, how do you paint anything near as beautiful as this view just give up, chill out and soak it all up … the Hebrides are just so full of colour. 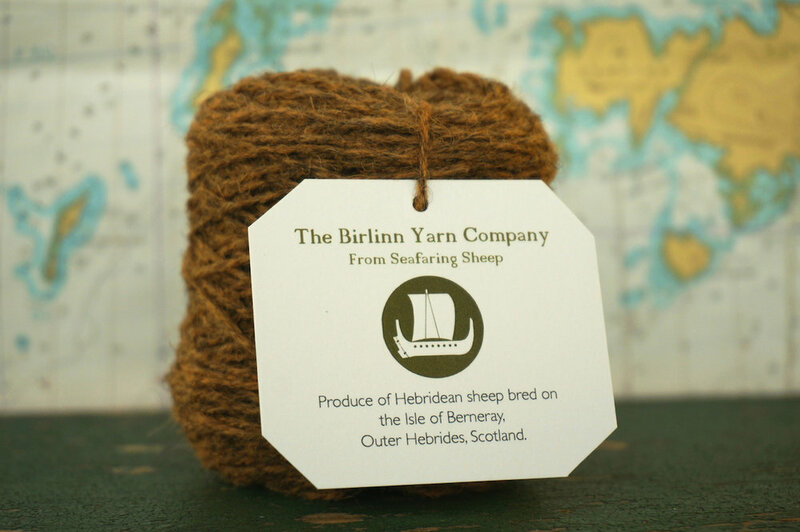 A couple of years ago, Birlinn Yarn started out as a natural yarn range with the ‘Mòine-dhon’ Peaty Brown of pure Hebridean, then introducing a blended yarn of Cheviot and Hebridean to produce ‘Glas-ghailleann’ Storm Grey and latterly our ‘Cearc Bhreac’ Speckled Hen twisting the pure Cheviot with Hebridean. All these earth colours are present in our environment in the peat banks of Loch Portain to the pebbly shores on our Isle of Berneray beaches. However, in spite of the portrayal of dreech Scottish weather and the wildness of the Hebrides, our environment is full of colour all year round. The Outer Hebrides is as much Highland as island with a range of environments within very short distances resulting in a very diverse biodiversity. This context and the muted, subtle colours of autumn and winter have been my touch stone when choosing the Birlinn Yarn organic colour range from mountain to sea. A cairn on Newton moor, the russet orange of Monadh moorland that evokes the deep, dank, musty smell of peat, heather and a day escaping to the hills. Còinneach - Moss … sphagnum moss a genus of around 380 species of peat moss, which can hold up to 26 times their dry weight, hence why you tend to get wet boots when try to cross it! Duileasg - Dulse … deep rose to reddish purple in colour this red seaweed is found on rocks, boulders and pebbles and as seen here attached to the larger kelps. It is a good source of minerals and vegetables and contains all the trace elements needed by the human diet with a high protein content. The organic dyeing process by the Natural Fibre Company has ensured that while based on a blend of our sustainably produced yarn we have not introduced any harsh or damaging chemicals to the process thus still in line with Birlinn Yarn’s philosophy of working carefully and sensitively within the environment. I will perceiver with my sketchbook but at least when I am just too overwhelmed by the beauty of these islands, I can always just pick up my needles and knit myself a little bit of the Hebrides.